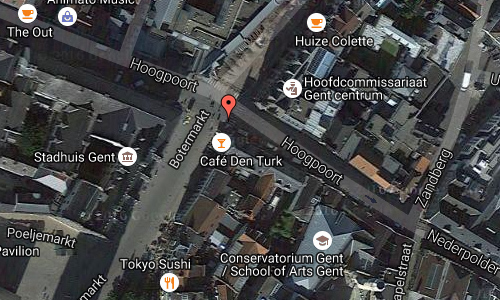 The corner of the Hoogpoort and Botermarkt is one of the oldest places in Gent, Belgium. 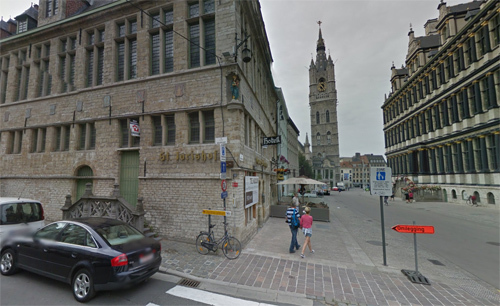 On the opposite site of this corner, you will fine the town hall of Ghent, which consists of two wings. It was designed by Rombout II Keldermans and Dominic the Waeghemaekere. The oldest wing (corner Botermarkt-Hoogpoort) is still in last Gothic flamboyant style and was built between 1519 and 1539. The facade niches containing the statues of the counts of Flanders. The nineteen images were late 19th, early 20th century made. 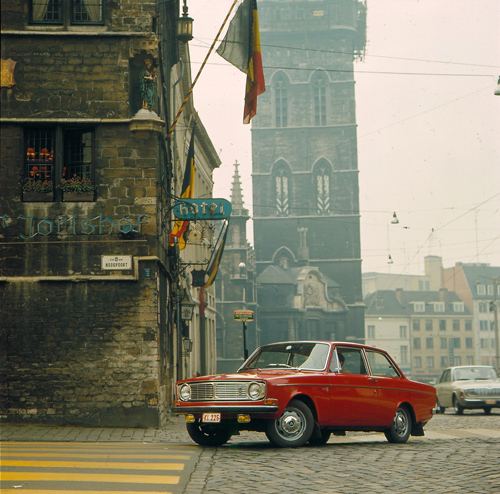 The tower in the background is the Belfort of Gent, or Belfry of Ghent and is one of three medieval towers that overlook the old city centre of Ghent, Belgium, the other two belonging to Saint Bavo Cathedral and Saint Nicholas’ Church. Its height makes it the tallest belfry in Belgium. The belfry of Ghent, together with its attached buildings, belongs to the set of belfries of Belgium and France inscribed on UNESCO’s World Heritage List. Ghent (Dutch: Gent) is a city and a municipality in the Flemish Region of Belgium. It is the capital and largest city of the East Flanders province and after Antwerp the largest municipality of Belgium. The city started as a settlement at the confluence of the Rivers Scheldt and Leie and in the Late Middle Ages became one of the largest and richest cities of northern Europe with some 50,000 people in 1300. It is a port and university city. The port of Ghent, in the north of the city, is the third largest port of Belgium. It is accessed by the Ghent-Terneuzen Canal, which ends near the Dutch port of Terneuzen on the Western Scheldt. The port houses, among others, big companies like ArcelorMittal, Volvo Cars, Volvo Trucks, Volvo Parts, Honda, and Stora Enso. 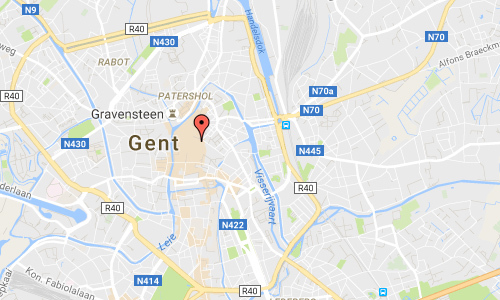 More information at visit.gent.be and en.wikipedia.org.